What is the difference between Brute Force and Credential Stuffing? Many people get confused between brute force attacks and credentials stuffing. To help clear this up, here is a simple description of the two. These are both in regards to the login form only. Brute force attacks on the login form consist of the attacker having a defined list (called a dictionary) of potential passwords. The attacker will then try each of these defined passwords with each username the attacker is trying to brute force. Put simply, this is a 1 (username) too many (password) attack. A common mitigation to brute force attacks is the implementation of account lockout. In this case, after 3, or 5, or 10 failed attempts for a single username, the user account is locked to block any more attempts. This drastically reduces the number of passwords that may be tried in a short period of time. Credential Stuffing is another attack on the login form but it differs from a brute force attack in that the list used contains both a username and a password. This list is often obtained through a data breach at another organization. The purpose is to find accounts that are re-used across multiple sites. In this case, the attack is a 1 (username) to 1 (password) attack. For each username, only one password will be attempted. Unlike with Brute Force, account lockout doesn’t have much affect on credential stuffing. Multi-factor authentication is a good mitigation as it will limit the use of valid credentials. There are lots of security tools available, so how do you know which one to pick? If your security team is not including the application teams in the decision, you run a big risk of failure. The security team does get the ability to form relationships with vendors. We see them at conferences. We know people that work there. Because our focus is on security, we know the tools that exist in our space and we have an idea of which ones may be better than others. Of course, this is often due to what we hear from others, rather than our own experience with those tools. Picking a tool in a vacuum is less than ideal. Sure, the tool may have five stars and has great detection rates. However, if the tool doesn’t fit into the development process and causes more overhead and friction, it will end up failing. A tool with 100% accuracy is still useless if it is not actually being used. I have seen over and over where a security group acquires a tool, especially static analysis, and a few months later they realize it is just sitting on the shelf. Like all of us, we are excited when we get a new toy. We use it, learn it. Then, the newness wears off. Without the proper processes in place, this can happen with security tools as well. We don’t want this to happen to you. The first step in determining which tools make sense is to understand the development process now and where it is going. Lets talk about static analysis for a moment. If your development process doesn’t make use of continuous integration and doesn’t plan to then that is not a high priority feature of the tool you receive. Have you considered what IDE the developers use? I once had a situation where static analysis was about to be rolled out. The security team worked to pick a vendor and get the ball rolling. It was later in the process that the development team was brought on board with the conversation. They asked questions that were less of a priority to the security team, but more of a priority to them. For example, The tool provided a plugin for their IDE. However, when digging deeper, the plugin ran a few versions behind. So what had appeared to be a good setup, now looked a little less efficient since the plugin may not work. This isn’t a deal breaker, but depending on how you were planning on this solution working, it adds friction to the process. The more friction, the more pain. The next step is understanding who will ultimately be using this tool? For those that listen to the podcast on a regular basis and follow my blogs, you know I am a huge fan of the application teams having direct access to these tools. In my opinion, static analysis is a developers tool. It is there to evaluate the source code and identify policy violations that only the developer can resolve. Giving them access and control over that function and embedding it into their process reduces that friction. Don’t confuse this with the idea that security is not getting the results. Security still needs to have insight into what is going on with security flaws within the application. But to be efficient, the results of these tools need to fit into the flow of how development works. Not be one-off reports under different processes. This is no different, in my opinion, than dynamic analysis or interactive analysis. These are tools that should be used by the QA group. The group that is responsible for testing and most likely already has automated testing capabilities. They are trained in identifying bugs, reporting, and tracking them. Building these types of tools into their process just makes sense. How many listeners have their own stories of the security team exporting a thousand page report out of that dynamic scanner and sending it to the application team as a pdf? I have been there. Even I won’t read through that report. The moral of the story here is that if we don’t understand how development works, what type of tools they already use, and what they can handle, we will probably pick a solution that will be ineffective, or at the very least, cause us a lot more work. The goal is not to just shove tools onto the development teams and say do this. As application security representatives, our goal is to help build better applications. That doesn’t mean that our job is to run all the tools and hound the application teams to fix items. By understanding the environments and processes we can pick tools that will fit much better, allowing us to focus our time on building out other solutions or processes for the organization. We are still relied upon to provide the expert advice and guidance to the issues that are identified. If you are considering implementing these types of tools, take a moment to sit down with all involved parties to get everyone on board. A well laid out plan will go much further than a shotgun approach. 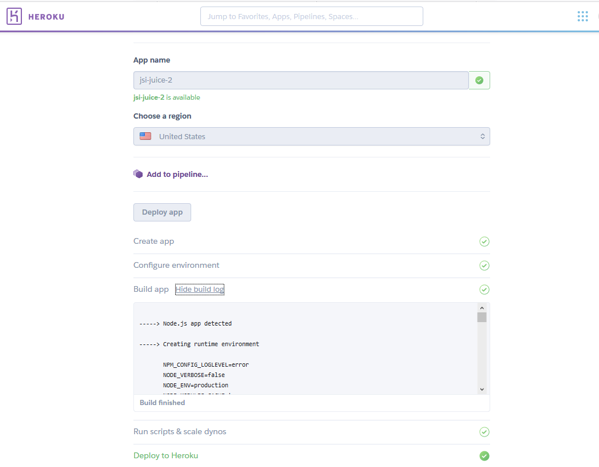 When it comes to testing for security within our web applications, we often look to creating simple tools to help speed things up. They also help provide a consistent way to help identify known patterns. 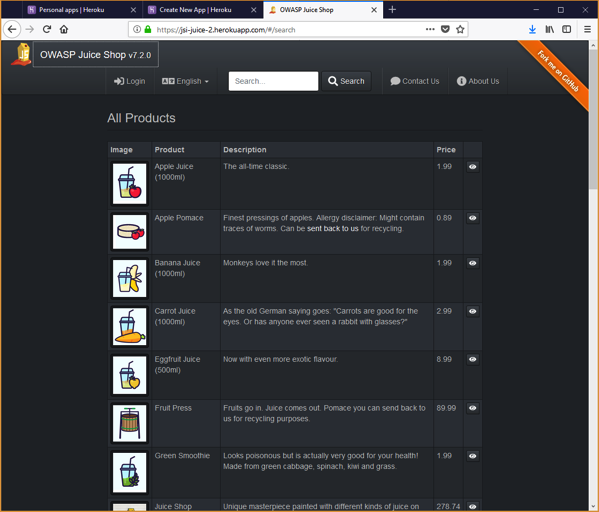 For those that haven’t been following, I have been doing a few posts about getting the OWASP Juice Shop application up and running. 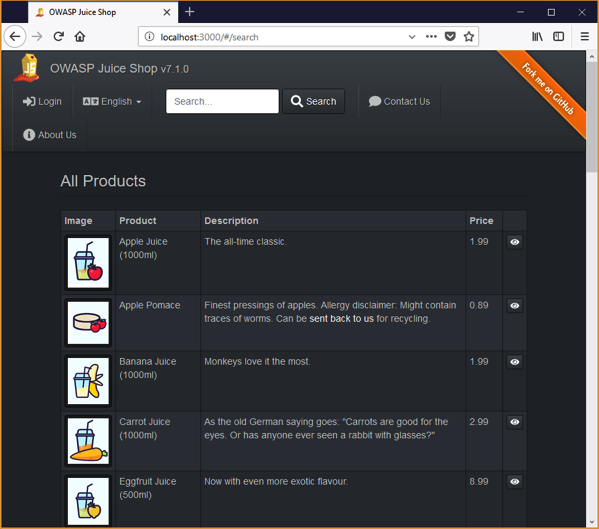 In this post, I want to introduce a simple burp extension I created to help with a few of the challenges presented in the OWASP Juice Shop. 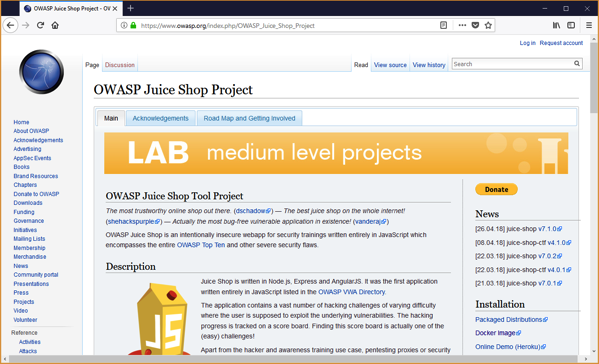 The OWASP Juice Shop has multiple challenges built into it to help guide the user along in finding web applications. The app is written as a single page app (SPA) and is a little different than your traditional applications. Rather than make a full page request for everything you click, instead the application just makes API calls. In short, the entire UI is returned on the first load of the application. 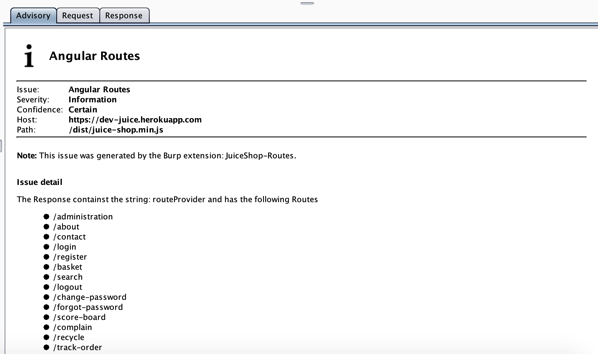 There are multiple challenges within the Juice Shop that require the user to access specific URLs that are not available via a menu or link. For example (and I don’t want to directly give away answers to the challenge here), imaging visiting the contact screen. If you click the menu item for contact us, it will update the URL in the address bar to be like /#/contact. So I don’t have to actually click a link to access the contact us page, I could just update that URL directly in the address bar. So how do you find the URLs that are available to access? There are multiple ways of doing this. First, of course, you could try to just fuzz them. This is good if the URLs are not available anywhere for us to find. Fortunately, this Angular application embeds the different routes within the client-side code. It uses a RouteProvider object to do this. With a little digging, you can find this information in the /dist/juice-shop.min.js file. This is a pretty large file and looking through it can be a little tough. Searching for RouteProvider will bring you to the route definitions. 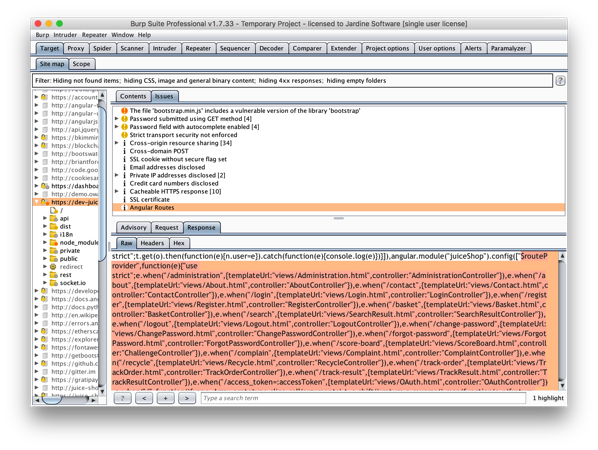 As a professional web app tester, I spend a lot of time using Burp Suite as my web proxy. It allows me to easily view and intercept all the traffic my browser sends back and forth to the server. Another cool feature is it allows building your own extensions to solve just this type of problem. Of course, you probably wouldn’t just create an extension for this one piece or a specific app. Instead, the hope would be that it would become helpful for other applications that use angular’s route provider object. This way, when I go to test other sites, I may get this information right there in my scanner results. I built a quick little burp extension that looks for the routeProvider object and then, if found, pulls out each route defined. The code can be found at https://github.com/jamesjardine/juiceshoproutes. The code that performs all the tasks are in the BurpExtender.java file. Looks to see if the response from the server contains the phrase $routeProvider. If it finds this phrase it then gets the start offset and the end of the object by identifying the next ] character. It then loops through the specific body text looking for a match to e.when. This basically defines when the URL matches X, load a specific template. Each route that is identified is then displayed in an unordered list. When you visit the Target Tab and select your site, click on the Issues tab to look for Angular Routes. This is just a quick example of how building custom burp extensions can help increase your efficiency or help provide some additional coverage for known patterns within applications. IF YOU ARE WANTING TO TRY THIS OUT WITHOUT SEEING THE RESPONSE FIRST STOP READING HERE!!! I am often asked the question by clients and students where people can go to learn hacking techniques for application security. For years, we have had many purposely vulnerable applications available to us. These applications provide a safe environment for us to learn more about hacking applications and the vulnerabilities that are exposed without the legal ramifications. 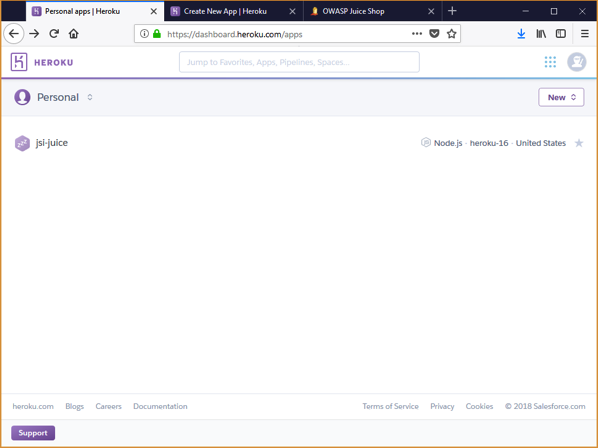 In this post I want to show you how simple it is to install the OWASP Juice Shop application using Heroku. Juice Shop is a purposely vulnerable application written using NodeJS and Angular. It goes beyond just being an application with some vulnerabilities. It is set up to be a capture the flag (CTF) style application with its own scoreboard. 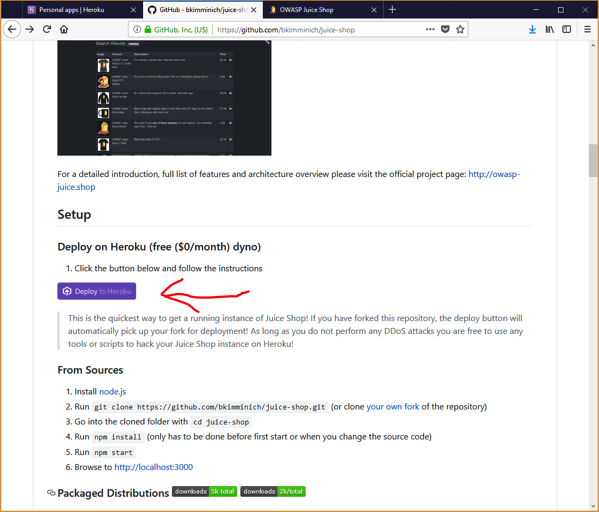 Now that we are logged into Heroku, let’s head over to the Juice-shop GitHub page at https://github.com/bkimminich/juice-shop. Fundamentals of Application Security (Live-Remote) – New classes starting in August/September 2018. Please remember that hacking is illegal. If you want to learn more about application security and test your skills, do it responsibly and use great applications like the Juice Shop as your targets. 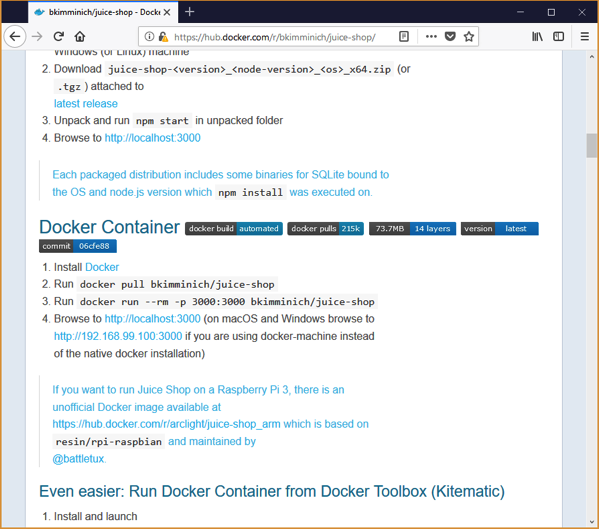 In this post I want to show you how simple it is to install the OWASP Juice Shop application using a Docker container. Juice Shop is a purposely vulnerable application written using NodeJS and Angular. It goes beyond just being an application with some vulnerabilities. It is set up to be a capture the flag (CTF) style application with its own scoreboard. As you can see, there are only 4 steps to getting up and running with Docker. The first step is to install Docker. I won’t cover that here, but make sure you do have it installed before continuing on. As you can see, the juice shop is up and running, listening on port 3000. Port 3000 was specified when we called run passing in the -p option. ** If you get an error about the container not being able to start up, try restarting docker. I ran into this a few different times and a docker restart resolved the issue.